The Global Brigades page on Empowered.org. Target audience: Nonprofits, cause organizations, social change advocates, foundations, NGOs, social enterprises, educators, community organizations. In the fall of 2010, a group of us launched Empowered.org, a free platform designed to help groups making a social impact. Our platform allows organizations to manage members, fund-raise effectively, recruit volunteers, grow organically and share your successes with their community and the world. We’re made up of a group of passionate and proven leaders from the nonprofit sector, mostly volunteers, who want to share our knowledge to exponentially grow grassroots organizations using effective online strategies. We support nearly every type of service activity, including international trips, local community projects, run-walks and leadership conferences. We know that money spent on fundraising means less money toward the ground projects that make a difference in the world. The Empowered platform allows organizations to conduct all of their fundraising, volunteer coordination, donor reporting, event planning and chapter management on one platform. The secret to our approach is that the Empowered platform can be integrated into your organization’s own website, allowing you to maintain you own branding and design all at no cost. We believe that fundraising should be free. Because we work exclusively with social change organizations, we know that money spent on fundraising means less money toward the ground projects that make a difference in the world. We’re proud to be completely free for social good organizations, with custom features available at a low pricing. Organizations can create activities, surveys and events and manage their volunteers with unlimited free access. Unlike other platforms, we allow for all fees, including merchant fees, to be passed to donors during checkout instead of as an additional cost to participating organizations. This means that not only do we make fundraising free, but organizations can also cover their credit card and merchant processing fees. Global Brigades, the world’s largest student-led health and development organization, turned to Empowered in 2010 to take over all of their online membership, fundraising and chapter management activities. To date, Empowered has helped Global Brigades to grow its membership by 300 percent! Most successfully for Global Brigades, Empowered has leveraged social networking to exponentially grow the organization’s volunteer base. Empowered has customized Facebook share options, allowing volunteers to share with their Facebook friends when they have made a donation through direct wall postings and general Open Graph actions. Optimizing social messaging and sharing has resulted in Global Brigades receiving 100 volunteers through Facebook every month and one-third of its donations come through Facebook, all via Empowered’s social share functions. 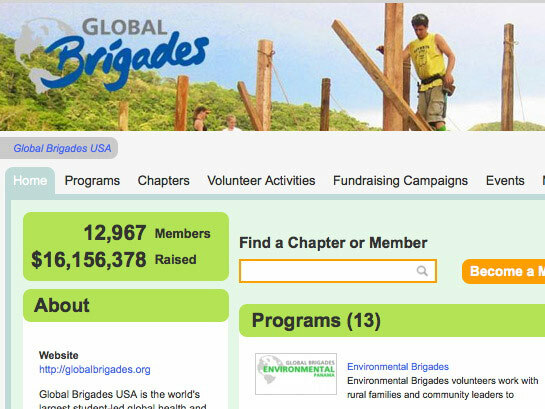 Global Brigades operates on a chapter model, with hundreds of chapters across North America and Europe, representing thousands of volunteers. Empowered allows organizations to create unlimited “group pages” for their chapters across the world, while all being linked to the organization’s underlying account. This model has allowed Global Brigades to experience viral and decentralized growth with targeted messaging and opportunities to specific chapters and sub groups. Members are able to interact around specific initiatives while still being linked to Global Brigades’ underlying organization account. As a result, Global Brigades has tripled its growth to over 520 chapters with more than 12,000 members – all of whom are connecting, organizing, and fundraising through one centralized and free platform! See how Empowered can take your membership organization and fundraising efforts to the next level. Visit Empowered.org or contact us at [email protected]. Christina Hirsch is passionate about connecting donors to the projects they care about through social media and visual storytelling. She works with nonprofits to photograph, document and share their stories with the world. You can follow the Empowered blog. Thanks for sharing this, Christina. We’d heard of Empowered but now have a better understanding of what you offer the social good community. Great stuff!